It is never too early to promote webinars and others events, so here is what I have coming up later this year. Sept. 4 & 5, 2:30 - 4:00 p.m. ET - Understanding and Defending Copyright in Your Library: An Introduction Workshop for ALA Editions. This is a two-part webinar. Additional information, including learning outcomes, is available on the ALA Editions website. Series Description: As a librarian, you are a defender of copyright and of proper and ethical access to information. In this two-part workshop, you’ll learn all about copyright, so you can help discern how your library and community can use print and digital materials within the confines of copyright law. Part 1: In the first 90-minute session, learn the basic rules of copyright law in ordinary terms and how to put its usage into context. Part 2: In part two, we’ll build upon part one and tackle two important areas crucial to libraries: Fair Use and e-books. Did you know there’s an actual test to determine if the use is fair? You’ll learn about that test and how e-books and other digital materials intersect with U.S. copyright law. Given that digital works are generally licensed and not sold, we’ll also look at how we can advocate on behalf of our libraries and community members. Sept. 18, 10:30 - 11:30am ET - Assuring Library Materials Can Be Used by Your Community for PCI Webinars. We’ve heard the refrains of eliminating the reference desk, embedded librarians, and the like. We also hear of the need to get out into our communities. Yet meeting our community members where they are – not where we are – is still a challenge. If we are free to move about our communities, and deliver services outside of the library, what might that look like? What innovative or imaginative twist can we use, which will spark the community’s attention and interaction? How can we assure that our efforts are accomplished in both safe and respectful ways? At Syracuse University,I will be teaching the following courses. If space is available, non-matriculated students can enroll in them. Geared for library and information professionals, this course provides a firm foundation in the fundamental rules of American copyright law, and equips them with the tools to make informed decisions about copyright issues. Advanced investigation of collection building, acquisition, and maintenance in libraries and information centers; user and collection analysis, collection development policies, digital resource acquisition and licensing, consortium collaboration, and ethical issues. I'll be attending the New York Library Association (NYLA) Annual Conference, Nov. 7-10, in Rochester, NY. I'm very excited about the location, which is relatively close to Syracuse. Also the keynote speakers - a social worker who works in a library and someone who links patrons with community resources - seem very timely. 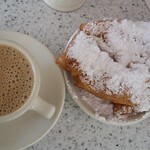 If you will be at the NYLA conference, let's find time for a cup of coffee. In libraries, collection development is vitally important and increasingly complicated. As someone who is teaching a graduate course on the topic, I can tell you that there is much that should be covered in an introductory course and not enough time for it all. Among the topics is licensing. Most people have not thought about licenses, even though they have agreed to many licenses in their online world. We generally do not actively seek to license something in our everyday life, so even beginning to think about the topic can raise anxiety levels. It is into this space that books such as this provide both needed education and guidance. Giving library professionals and students the understanding and the tools needed to negotiate and organize license agreements, Harris uses a plain-language approach that demystifies the process. Her guide explains licensing terminology and discusses changes in technology, including developments such as text and data mining; points out opportunities for cost savings; features many useful tools such as a comprehensive digital license checklist; provides sources of additional information on the global aspects of licensing; and walks readers through educating organizations that have signed license agreements. If you are responsible for licensing digital content, or will be in the future, resources like Licensing Digital Content: A Practical Guide for Librarians are ones that you consider reading and referring to. 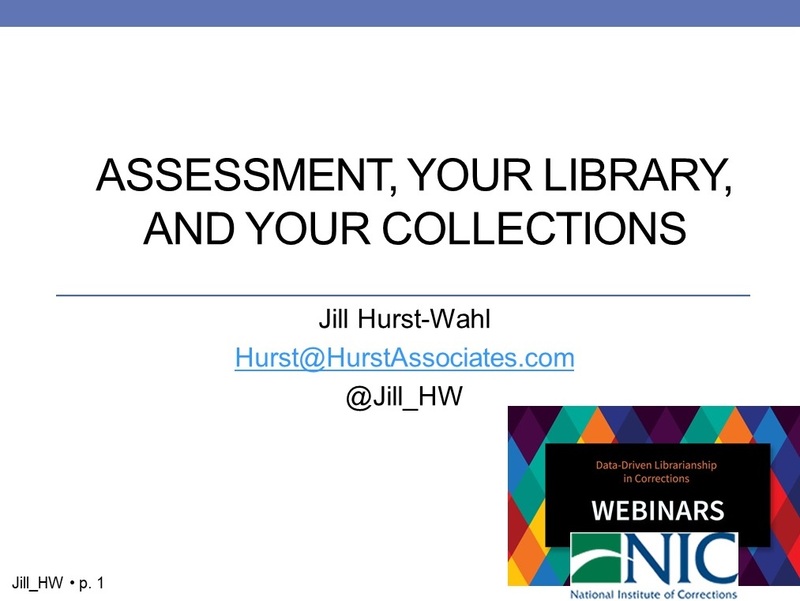 As part of its Data-Driven Librarianship in Corrections series, today I'm giving a webinar for the National Institute of Corrections, which is part of the U.S. Department of Justice. Below is the descriptions and the slides are available on SlideShare and the handout is on my web site. The event is being recorded and I'll update this post with that information after the fact. Description: Expanding on Ranganathan’s five laws, we know that libraries are for use and that every library has its community (users). In order to ensure that a library is meeting the needs of its users, the library must be able to assess its services, including its collections, and understand how those are meeting the requirements of its community. 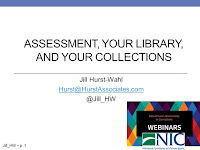 This webinar will investigate the assessment activities that a library can utilize to determine the needs of its community, as well as those assessments which can help a library assure that a service is meeting its community’s desires. Specific assessments, which can be completed in any type of environment, will be discussed and examples given.